It was my 20 week scan on Wednesday. I was really anxious beforehand, for some reason I was convinced that expecting to have another healthy baby was totally pushing my luck and they would find something wrong. Thankfully, everything was exactly as it should be and our little girl looked perfect. 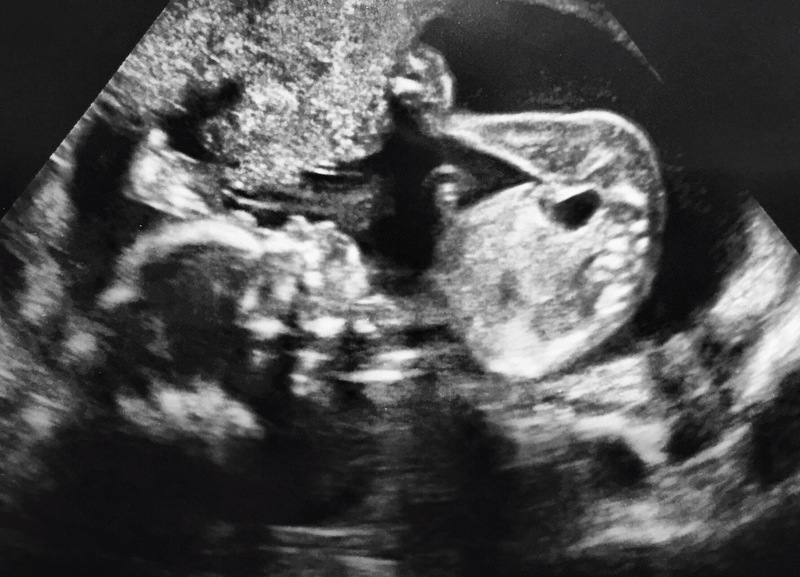 Even though I have had so many babies I am always fascinated by the detail in scans, her heart is only as big as a thumbnail yet we could see all the chambers and so much detail, it really is amazing! I&apos;m half way through! Reaching 20 weeks is a real milestone, and feels like it won&apos;t be too long now until our little girl is here, especially if time keeps flying by like it has done recently! It&apos;s half term, at last!! Working in a school it often feels like we are constantly on the countdown to the next holiday, but this one has seemed to take forever to come around – possibly because work has been crazy this week and most of the country seem to have been on half term already. I am more than ready to step off the treadmill of 6am alarms, school runs, multiple drop offs, work, homework and just the general routine! Lazy mornings, deciding what to do that day on a whim and lots of family time in the fresh air is more than welcome. We haven&apos;t got much planned, except for it&apos;s Tinker&apos;s 5th birthday this week (even though it seems utterly ridiculous that she&apos;s 5 already!) so we have a party planned for tomorrow (wish me luck!) and will go out on a trip somewhere of her choosing on the actual day. We have even been promised a bit of half decent spring-like weather this week so that will be a lovely bonus. Tinker – she has had a really good week, she is sleeping much better which is definitely helping and other than the odd occasion she has been a real sweetie. The mood in the house can quite often be dictated by her moods so we are all happy when she&apos;s happy. 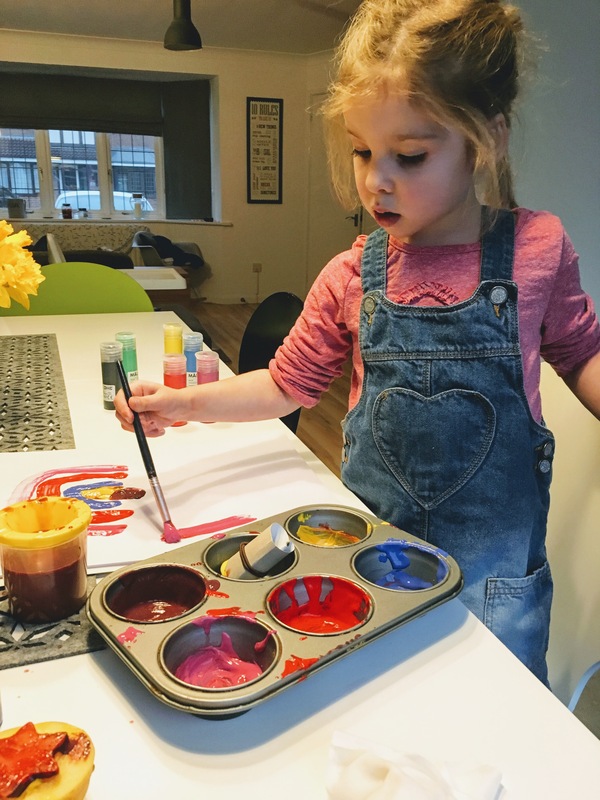 She loves anything creative and as she has been so good we got her paints out at the weekend. Valentine&apos;s Day – we don&apos;t bother with it, which people who know us are quite surprised about. I just find it a bit too prescriptive and predictable (overpriced red roses, chocolates, soppy cards). I much prefer it when Mr T randomly surprises me with a bunch of daffodils when I&apos;m least expecting it, or gets up with the girls when it&apos;s not his turn (and doesn&apos;t even complain). However, this year it just felt like love was in the air and everything was a bit better because of it so it made me think Valentine&apos;s Day is actually ok after all. And despite agreeing not to get each other anything Mr T came home with a chocolate orange for everyone and I got our favourite caramel custard doughnuts for us all, so we weren&apos;t entirely without valentine&apos;s treats after all. Totsy – at the moment one of her favourite things is colouring. 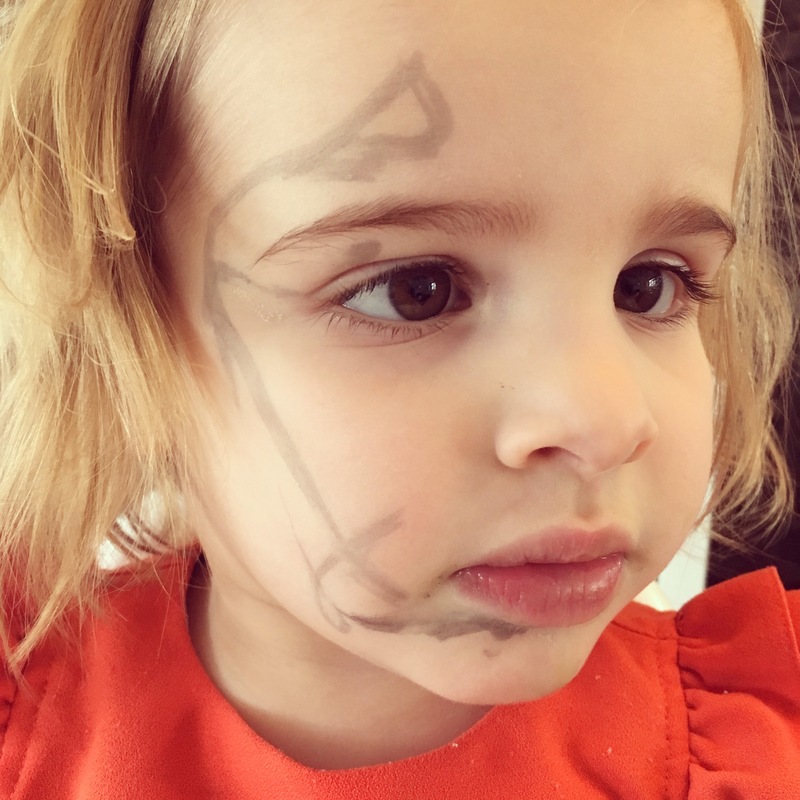 This week I turned my back for two minutes while she was drawing and this happened: I couldn&apos;t help but laugh, and fortunately baby wipes got rid of it. Her other favourite thing currently is looking at books which means lots of lovely snuggles while we read stories. Tags: 20 weeks pregnant, half term, Valentines Day. Bookmark the permalink.